Your guide will know all the best snorkeling spots. (Listen carefully to get ideas for where to go if you decide to hire a boat for a day.) Most Bora Bora Tours will include opportunities for snorkeling. You will see a wide variety of colorful tropical fish, manta rays, eagle rays and gray rays. The friendly rays interact with people. They will swim right up to you and glide so close that they tickle you as they pass. The only time I have seen graceful, black tip reef sharks in the lagoon, is at the entrance where guides have trained them to come for feeding during boat tours. Teremoana Tours has an all day tour with stops for snorkeling. It begins with a stingray feeding. This tour includes a relaxing picnic on a motu where you can snorkel while the guide prepares the island food. Later your guide will take you to explore a 'coral garden' for another amazing snorkeling experience. They also offer a half day tour. Our favorite tour guide on these Bora Bora tours is Marona. 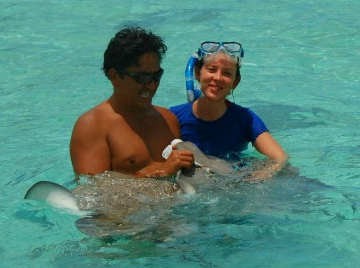 Companies like Temanava Tours provide all day or half day Bora Bora excursions with stops for snorkeling. They begin with a stingray feeding. This tour includes a relaxing picnic on a motu where you can snorkel while the guide prepares island food. Later you will be taken to explore a 'coral garden' for another amazing snorkeling experience. Read about our favorite tour guide, Marona, who gives the best Bora Bora excursions.